No recovery or "Zero Recovery" in damaged corals. Coral bleached for two consecutive years at Australia’s Great Barrier Reef has “zero prospect” of recovery, as scientists confirmed the site has again been hit by warming sea temperatures. “Bleached corals are not necessarily dead corals, but in the severe central region we anticipate high levels of coral loss,” said a marine biologist at James Cook University who led the aerial surveys. “It takes at least a decade for a full recovery of even the fastest growing corals, so mass bleaching events 12 months apart offer zero prospect of recovery for reefs that were damaged in 2016,” Mr. Kerry said. 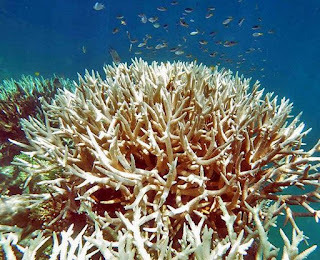 It is the fourth time coral bleaching — where stressed corals expel the algae that live in their tissue and provide them with food — has hit the reef after previous events in 1998 and 2002, scientists said. Lok Sabha passed a bill for Equal Rights to HIV patients. → FATCA or Foreign Account Tax Compliance Act requires that the bank accounts which were opened between July 1, 2014 and August 31, 2015 should be self-certified on self-certify forms by April 30, non-compliance will lead to account blocking. → This is as per the Inter-Governmental Agreement IGA with US for implementation of FATCA which was came into force on August 31, 2015. Bill pass in both the houses are. President Pranab Mukherjee has accepted the recommendation of Committee of Parliament on Official Languages for all speeches by the dignitaries to be only in Hindi if they can read and speak the language. The decision has come after six years after the committee made 117 recommendations to make Hindi more popular language.